Goreme is a beautiful and otherworldly town in Cappadocia, Turkey. Carved into volcanic rock by time and human ingenuity, Goreme and its surrounding valleys contain underground cities, cave churches and striking pinnacles known as fairy chimneys. 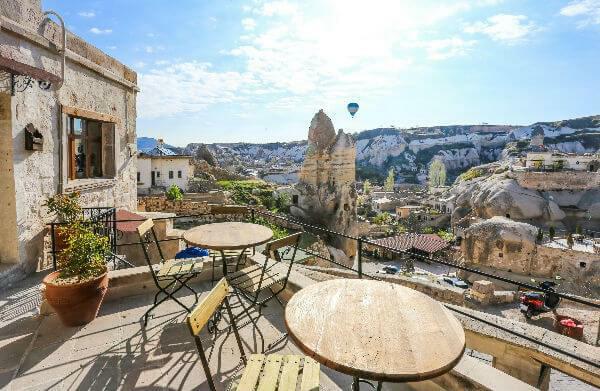 Goreme itself is a small town with two beautiful sites: the Open Air Museum, with its own collection of cave churches and fairy chimneys, and Uchisar Castle, which is the highest point in Cappadocia. A hike to the top will reward you with unforgettable views. If you want to see more than the castle view, a hot air balloon can take you into the sky. 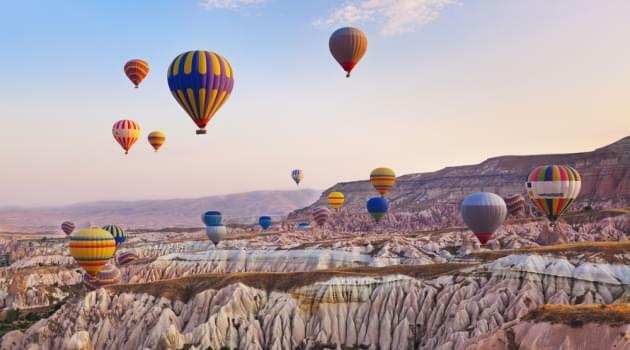 These colorful balloons are for hire in Goreme, and launch just outside of town. Goreme is also the gateway to the Goreme National Park, a huge UNESCO World Heritage Site. The town is the main tourist center serving the area. There are plenty of travel agencies running tours to the most visited sights in the park, including the fairy chimney dotted landscape of Pasabag (Monks’ Valley) and the ancient cave dwellings of Ihlara Gorge. Despite being one of the most visited places in Turkey, Goreme remains surprisingly affordable. A good hotel will run you less than $120 a night, and the nicer restaurants in town only charge about $10 for an entree. And where else can you stay at a cave hotel or rent a fairy chimney apartment? There are, of course, ways to get to this amazing place with an award ticket. But since Goreme is located far from Istanbul and Ankara—the busiest Turkish airports—your flying options are a bit limited. There are two airports near Goreme: Erkilet International Airport in Kayseri, and Nevşehir Kapadokya Airport in Nevşehir. Both airports are served by Turkish Airlines. Since Turkish Airlines is a member of the Star Alliance, your best bet is to use United MileagePlus miles. Turkish Airlines flies to Kayseri via Istanbul and, seasonally, from Vienna, Stuttgart and Düsseldorf. Although it’s an excellent airline with comfortable seats and good food, even in economy, you don’t have to fly all the way to Goreme on Turkish Airlines. You can fly on Lufthansa or Austrian Airlines for the first leg from the U.S., and then continue your flight on Turkish. If you decide to go to Nevşehir’s airport, your only option is to fly on Turkish Airlines via Istanbul. Despite the limitation, it’s actually easier to find an economy award ticket for this route. As an added bonus, the travel time to Goreme from Nevşehir is about 20 minutes shorter than from Kayseri. You may want to consider flying in business or first class. Either route offers about the same availability for premium cabins, and Turkish Airlines has one of the best business class products in the world. No matter which class you fly, you won’t have to pay a fuel surcharge because United doesn’t tack one on to the price of an award ticket.